Google has unleashed a new project on the world,TipJar, and aims to put the best money-saving suggestions in the public domain. 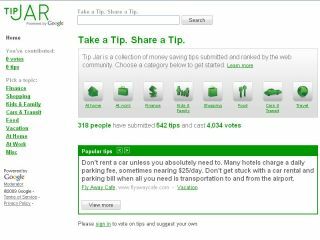 TipJar is a collection of money saving tips submitted and ranked by the community, with people voting on their favourites. It's early days and some of the tips (sample: Quit smoking: it will save you loads) are a little simplistic at the present time, but Google's massive audience could make it a little more meaningful as it gets going. "At Google, we put a lot of stock in both the wisdom of crowds," says the official Google blog. "The idea that lots of people responding to a given question can collectively find the best answer — and the value of community. We believe that people working together can help one another through even the most difficult times." "Tip Jar gathers tips in one place and invites people — i.e., you, me and everyone else — to rank them in order of usefulness and even add their own tips to the list. Over time, the best and most useful tips will rise to the top."